This textile was thought to have been made between the 10th and 15th century C.E. in Egypt. It is plain woven linen, embroidered in double running stitch in blue and pink silk. There are three rolled hems along the top, bottom, and right hand side of the textile. It is 19.5 cm wide by 12.5 cm high. It is currently in the Ashmolean Museum, accession number EA1984.408. I have charted up the design. It is available as a pdf. This textile is thought to have been made between the 10th and 15th century C.E. in Egypt. The dimensions are 18 cm by 19 cm, with the ground fabric of tabby woven linen embroidered in running and double running stitch in blue and red silk. There is a selvedge along the top of the textile. I have charted the design. It is available to download as a pdf document. 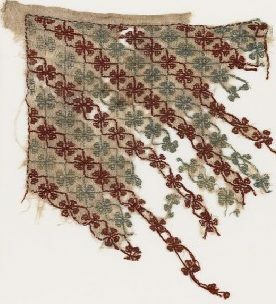 This embroidered textile was found in Egypt. It is linen embroidered in blue flax and red silk and was thought to have been made between the 10th and 15th century C.E. The length is 18 cm and the width is 9 cm. The embroidery is mainly in blue flax, with some red silk being seen on the edges of the embroidery. The textile is currently in the Ashmolean Museum. I have charted up the design. It is available in PDF format for download. I would love to know how it embroiders up! This textile is thought to have been made between the 10th and 15th century C.E. in Egypt. It is linen, embroidered in dark blue silk in double running stitch. The dimensions are 5cm high by 12 cm wide. On the very right of the textile is the selvedge. The textile is currently in the Ashmolean Museum. I have drawn up the chart. Let me know how it goes! These earring were thought to have been made between the 10th and 11th century in either Egypt or Syria. At the time the area was ruled by the Fatimid dynasty. The earrings are a combination of sheet, wire, filigree, and granulation work. 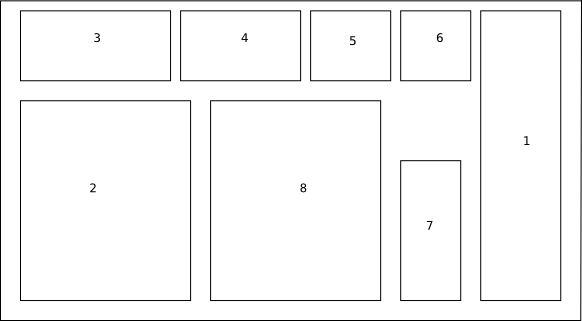 The first earring is 6.4 cm high and 3.3 cm wide; the second is 6.7 cm high and 3.3 cm wide. The earrings are currently in the Metropolitan Museum of Art. This ring was thought to have been made in the 11th century in either Fatimid ruled Egypt or Syria. It is made of gold in sheets, decorated with filigree and granulation. The ring is 2.7 cm high and 2.5 cm wide. The diametre is 1.4 cm and the weight of the ring is 5.7 grams. The ring is currently in the Metropolitan Museum of Art where there are more pictures to see. This pendant was also thought to have been made in the 11th century Egypt. It is a rare enamelled piece, made from gold sheet, decorated with filigree, wire work, and inset with turquoise. The enamel itself was later glued into place after the design had been finished. The pendant is 4.5 cm high and 3.5 cm wide. The pendant is in the Metropolitan Museum of Art where there are many other pictures, including one of the back. This gold belt buckle was thought to have been made in 12th century Syria, which at the time was ruled by the Ayyubid dynasty. It is 10cm long, made of twin plates to cover the end of the leather. The gold buckle has extruded knobs and bosses while the front plate is decorated with a cartouche of a falcon attacking a bird. It was sold by Christies for £17,250 (or $28,683). Near Eastern Jewelry: A Picture Book by Dimand, M. S. and H. E. McAllister. Available for download via the Met or read online through Google Books. Mamluk jewelry: influences and echoes by Jenkins, M. As published in Muqarnas: An Annual on Islamic Art and Architecture, Vol 3. Islamic Jewelry in The Metropolitan Museum of Art by Jenkins, M. and Keene, M. Available for download via the Met or read online through Google Books. This textile is known as the veil of Sainte Anne, which is kept in the basilica of Sainte Anne in Apt, France. The legend had it that the veil was found in a vault under the basilica. However, it is a textile that originated from Damietta in Fatimid Egypt, in the 11th century C.E. It is 310 cm wide and 152 cm high, made from linen with tapestry woven roundels of animals, mythical animals, plants and tiraz. which isolates the date to either 1096 or 1097 C.E. 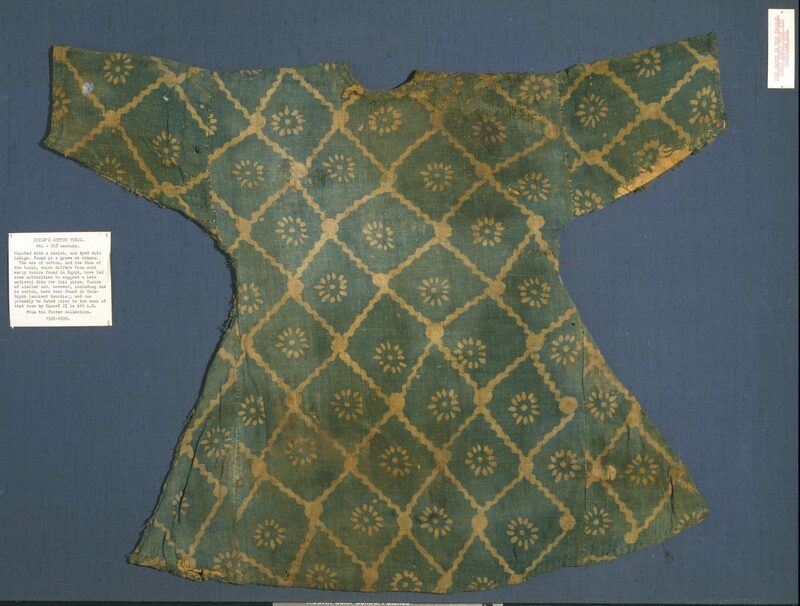 The textile is thought to be a back of a khila´ or ceremonial gifted robe known as an ‘abā which is a sleeveless coat. Writing Signs: The Fatimid Public Text by Irene A. Bierman. Via Google Books. The veil of Saint Anne by H. A. Elsberg and R. Guest. The Burlington Magazine for Connoisseurs, Vol. 68, No. 396 (Mar., 1936), pp. 140+144-145+147. Via JStor. Symbols of Power by Louise Mackie. Via Google Books. Qantara: Veil of Saint Anne. 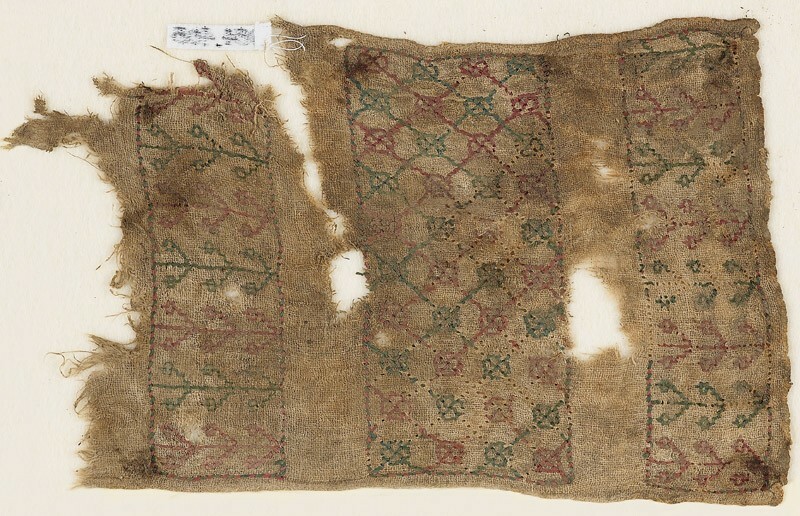 This textile was thought to have been made between the 10th and 15th centuries in Egypt. It is linen, embroidered in blue and pink silk in a quartrefoil pattern linked by squares. There is also a rolled hem in yellow silk at the bottom of the textile. The textile is 24 cm by 13 cm. Thread count of the linen is 22 threads per cm. The embroidered band itself is 7.3 cm. It is currently in the Ashmolean Museum. My name is Miriam bat Shimeon. In the Society for Creative Anachronism I live in the Barony of Stormhold, Kingdom of Lochac. I have set up this site to help spread knowledge on the lands of the Islamic Middle East (known as the Dar al'Islam) from the fall of the Roman Empire to 1600 C.E.